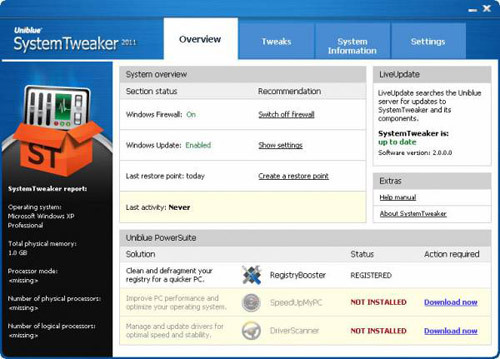 If you find it difficult to customize your Windows Operating System then Uniblue System Tweaker is for you. SystemTweaker is a safe and easy to use tool that lets you customize Windows to your taste. It comes with over 50 tweaks which will let you tweak almost everything is your Windows. To get your free license code, visit the Softpedia Exclusive Uniblue System Tweaker 2011 Promo Page and follow the instructions given there. this xmas i got to much of software license… thanks for sharing one more to my collection.. Thanks for sharing the info. Gonna try it now itself. Thanks for sharing i will use that. Thanks for sharing the info !! I have used this program almost exclusively to repair numerous computer issues. Two thumbs up for RegistryBooster.